IAS officer Varsha Joshi who calls herself a pathological reader has spotted the review of a book titled “Bureaucratics” written by Dutch historian and documentary photographer Jan Banning last year. As described in a blog post (brain pickings), Banning brings “a conceptual, typological approach to the dreariest of desk jobs, blending humor and absurdity with an astute portrait of socio political ineptitude”. 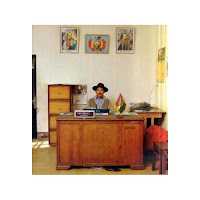 As Banning himself has described, “Bureaucratics” is a “product of an anarchist’s heart, a historian’s mind and an artist’s eye.” It covers eight countries on five continents: Bolivia, China, France, India, Liberia, Russia, the United States, and Yemen. The visits were unannounced and “that way, the photos show what a local citizen would be confronted with when entering”.